This is why the street outreach hotline is so important, says Holman - they don't know where everyone is, which is why they want folks to call. Outreach workers and others want to keep checking on people who refuse to come in. Holman says the new warming shelter is a pilot program. The St. Louis County-funded program opens a community room at City Center West, 5830 Grand Avenue (a complex that also houses a library branch, a fire station and a police substation, and a senior center has programming there during the day) from 10 p.m. to 6:30 a.m. on nights predicted to get to 0 or colder. There's been a lot of conversation that that threshold should be raised to at least 20 degrees, but Holman says she's grateful that after many years of asking, the warming center is open. "We have let folks remain in the cold for many years in this city. (I'm) Glad this is making more people pay attention," she wrote on Facebook. "Grateful the county is finally willing to do something to get folks out of the cold. This pilot is making many aware of the real issue and problems with folks experiencing homelessness. Glad to see so many speak up." Joel Kilgour of the Loaves and Fishes Community, which operates the Dorothy Day House, is one of those who hopes that the hours of the shelter - and the temperature threshold - can be expanded. "While we celebrate our city providing a warming center for folks who don't have it during the night, we hope the temperature requirement for the center opening its doors to the public to be raised above zero degrees," he wrote on the Dorothy Day Facebook page. "Pilot projects are meant to learn and grow from. We encourage the city to engage with voices of people experiencing homelessness and enact policy that supports those voices. We can do better. "Let us be clear. Opening a warming center on days that drop below zero is a good thing, and it is a good thing that advocates, the city and the county have come together to make this happen. But it isn't a time to pat ourselves on the back. "More than 800 households in Duluth are on a priority waiting list for housing because they are homeless. Many will sit on that waiting list for months or even years. We can and should celebrate when we take significant steps to build permanent housing for everyone in need. 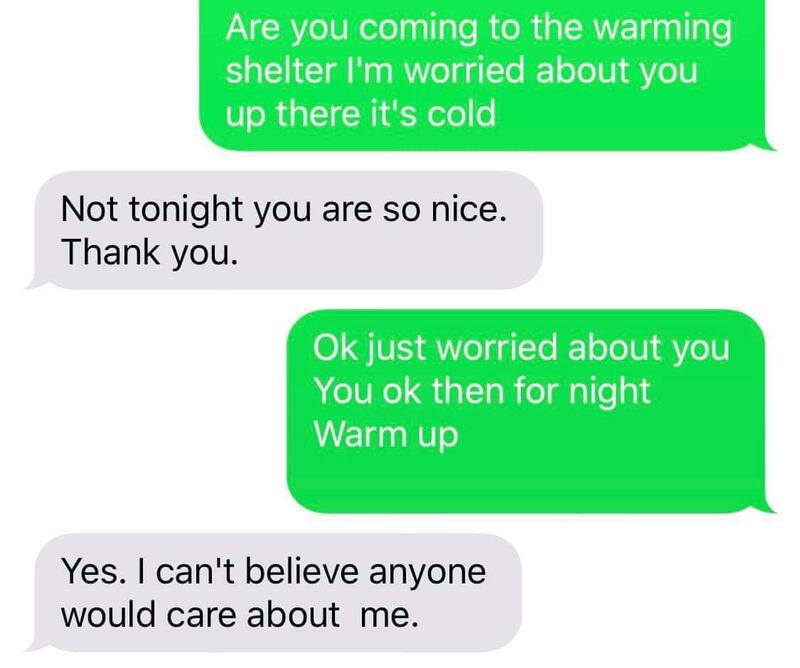 In the meantime, a warming center open for 8-1/2 hours on nights with the most extreme cold is literally the least we can do to keep people from dying. Lee Stuart, executive director of CHUM, believes the real solution to chronic homelessness in our community will need to address the fundamental cause of homelessness for many people. In addition to a shortage of affordable housing in our community for most citizens, she believes that the most vulnerable, those with untreated mental health or chemical dependency issues, will need an extra hand to get them off the streets and perhaps on a path to reclaim their lives. "What we really need as a start is 600 efficiency apartments with supportive services for people with multiple challenges," says Stuart. "Let's build that refrain." Meanwhile, Deb Holman says "we need to care year round. Not just when it’s 20 below." But in a recent post she wrote, "It’s a good start. When I left tonight 36 were accessing the space. "Out of the deadly cold." A man living in a tent on Duluth's west end was rescued New Year's Day after being found in a nearby ravine. The man, who may have been trapped in the ravine for several days, was known to local homeless advocates and had refused their services in the past. People with mental illnesses and chemical dependency problems can refuse treatment for those conditions - and refuse help or other services, too. But at what point does society need to - or even should - override someone's right to make their own decisions? "It's a tough spot for us to be in ... but we're trying to help people. That means everybody." It was not the start to the new year anyone wanted: a 911 call from someone saying a friend was armed and suicidal and prowling the UMD campus. But within half an hour, the man (who did not have a weapon) was apprehended, taken to a local hospital and then to the St. Louis County Jail, where he was booked on trespassing charges. "If people can afford $3,000 in rent, do we really need to be subsidizing their housing?" Emotions were already running high at this week's Duluth City Council meeting, where councilors were, it seemed to some, pressured into taking an immediate vote on a $6.2 million-tax increment financing package for a 15-story apartment building downtown. The Loaves and Fishes Community, AICHO, the Duluth Branch of the NAACP and other social justice groups called on the council to table the vote until they could address the issue of affordable and low-income housing. "I'm really scared. This has never happened to me before." The Loaves and Fishes Community is a small non-profit in Duluth offering "hospitality and advocacy to people experiencing homelessness." But Joel Kilgour, a longtime resident of the men's house and community organizer and activist, says they're turning away "probably 30 guys a day." Perhaps the most visible faces of homelessness are those of people suffering from mental illness or addiction, but Kilgour says most of us are only one step away from living under a bridge ourselves.